Kenny is Newcastle born and bred. 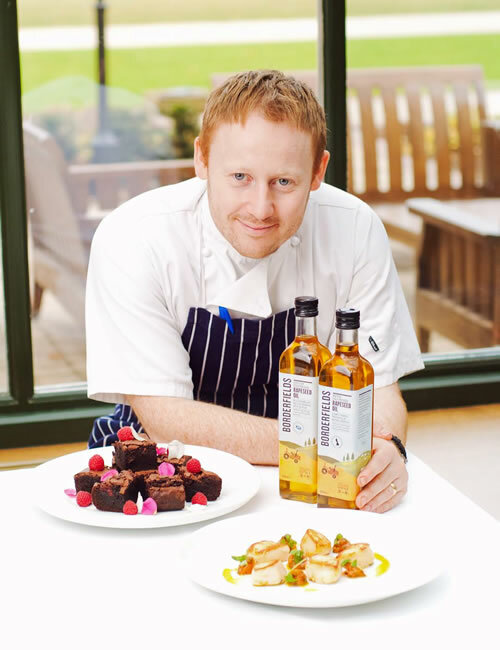 He took on his first head chef position at the Greenway Hotel near Cheltenham in 2003, a post he remained in for nearly three years, winning three AA rosettes. He then moved to St Martin’s on the Isles of Scilly in 2006, when he was appointed Executive Head Chef of St Martin’s on the Isle. During his stay on the island, the hotel was named Cornwall Restaurant of the Year by the Good Food Guide and achieved a Michelin star – the first for an establishment on the Isles of Scilly. In July 2008, Atkinson returned to his roots to take over the executive head chef role at Seaham Hall Hotel in County Durham, where he soon earned his second Michelin star at The White Room. He joined Rockliffe Hall in December 2009, and within weeks of opening Rockliffe’s flagship fine dining restaurant ‘Kenny Atkinson at The Orangery’, he was appearing on the Great British Menu and shot to national fame with his much loved and winning mackerel dish. The Orangery was awarded three AA rosettes within 9 months of opening and has fast gained its reputation as the highest quality fine-dining restaurants in the North of England. Now owner and head chef at House of Tides on the historical Newcastle Quayside, Kenny has always remained fiercely loyal to local suppliers and offers top quality food across all menus: “I want to see the money I spend go right back into the local farmers’ pockets,” he explains. The restaurant was awarded 3 AA Rosettes and 1 Michelin Star in 2015, as well as numerous recent accolades including AA UK Restaurant of the Year 2015-2016 and North East Restaurant of the Year 2014 and 2015.